Drug overdoses are the leading cause of accidental death in the United States, killing more people than the AIDS epidemic at its peak. It is a problem, but the name distracts us from the causes. Addicts are ignored when we focus on the drugs. We forget there are multiple steps that lead people to make choices that can kill them. On the Center for Disease Control website there is a lot of space devoted to solutions. None of the strategies are focused on addressing the reasons people choose drugs to fix everything from insecurity, to economic hardship, to severe depression. Either way, as a society we need a better way to support each other before people take desperate measures to address their pain. Mater Dolorosa: A Grieving Mother, acrylic on wooden panel, by Nancy Polo, 2018. Last year, my friend went through the unthinkable. In the span of two months she lost two of her three sons. Her oldest, a 43 year-old father and husband, succumbed to depression and committed suicide. Within weeks another son, 26 year-old brother to a twin, overdosed on heroin laced with fentanyl. Nothing can assuage the pain of a mother who loses her children. Understanding her pain, however, can go a long way to preventing other mothers from losing their children. Absorbing another person’s pain takes a deep level of compassion, one that only comes from introspection of my own life. My heart aches for my friend. In an attempt to help her grief, I made a painting of that process. Mothers are connected. Anyone who bears the weight of a child, not only in pregnancy, but throughout the life of that child, has a unique perspective on pain. We ache through everything from our teething babies, to depressed adults. We want to take their pain away and guide them toward the best solutions for all their problems. Motherhood is a primal force. It inspires women to act on behalf of all children, at all ages. Once someone reaches their arms to you and calls you Mother, you are forever changed. It is heartless to look on the pain of any other mother, and not feel the urge to change something so that pain is obliterated. In Mater Dolorosa, my friend and I stand as book ends to a surreal scene. Both dressed in black and bathed in a warm light, we are trying to bridge a gap with our hands outstretched. On the day of the second memorial service my friend seemed to glow. Her hand clutched and crushed a plastic water bottle to her heart as she greeted all the guests. It was the only gesture that belied her grief. She was still cocooned in a state of shock. I knew that would fade to a raw pain. In my terror of the inevitable I reached out, mirroring a grief that only a mother can understand. In the care of a child, mothers plan and hope for the best. We procure whatever resources we can for the development of a person given to us. When a child dies, no matter when, mothers cannot fulfill a purpose that is written into their body, their very essence. The gnarled and stunted tree in the middle ground reaches across a beautiful sky with exclamation twigs like lightning. Family trees are supposed to be sturdy structures that carry us across generations, never failing to manifest the future. This one has been corrupted to bear menacing fruit. The hand at the base of the tree is a tentacled danger, wielding a sharp needle. The aim of its fingers feels arbitrary. 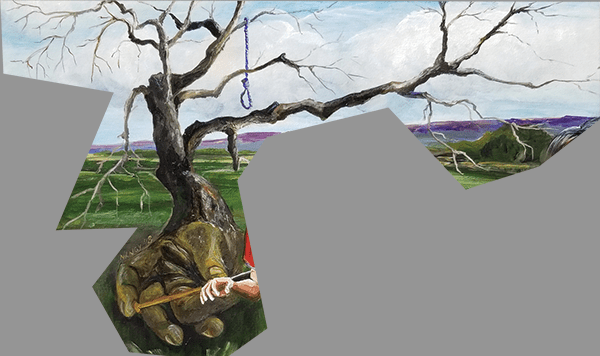 An empty noose hangs lifeless from an upper branch–a paltry replacement for the life that was plucked from these limbs. And what of the boys? Did those souls choose an entry and exit point to this world? 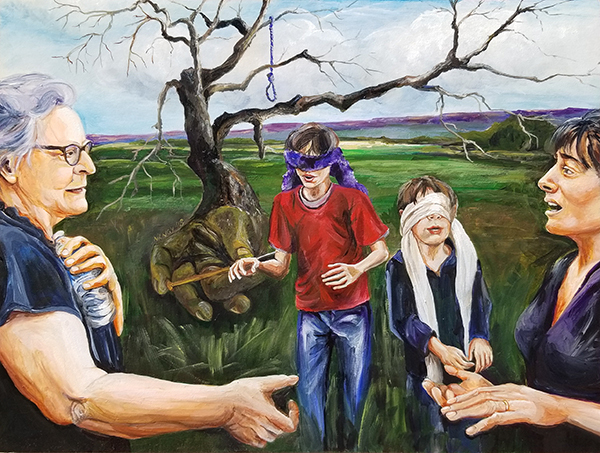 In the painting they are blindfolded and very young. Handicapped, their reaching hands and open mouths lead them forward. The hearts of mothers hold many images of their children. These shift with emotion like clouds in a sky. Mothers are most attuned to those precarious moments of blindness. We cannot always guide our children. Nothing feels more vulnerable than this. The road from birth to death is not ours to engineer. 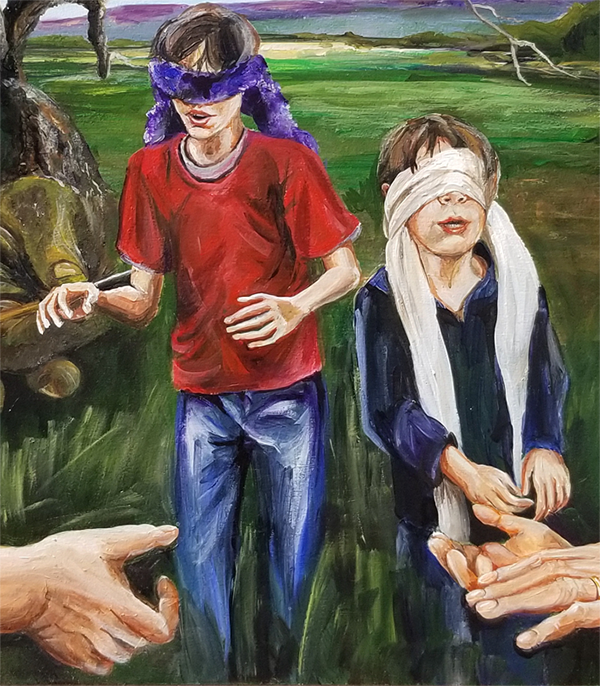 I’ve intentionally painted two boys to look like they are playing a game. Soft, loosely tied scarves seem easy to remove. The trouble is anything can happen in moments when the road is hidden. The pain of this painting is universal. In spite of monumental efforts, a drug epidemic has ensnared all of us. It’s not a war on drugs we should be waging. It’s compassion and empathy we should be fostering as we look for solutions. A good place to begin is Amanda Coletta’s January 24, 2018 article, Canada’s fix to the opioid crisis: Vending machines that distribute prescription opioids to addicts. The US and Canada are experiencing the same epidemic, but their solutions could not be more different. Canada, a country that provides healthcare to all its citizens, is guided by deep compassion. The US, in contrast, has the most expensive and least effective healthcare system among western nations. Profit appears to be the guiding principal in the States. If you’re faced with a crisis as a mother, you look for the best solution that ensures your child’s safety, regardless of cost. In British Columbia, the location of the planned vending machine project, there are eight supervised injection sites. These are clinics where addicted patients are given illegal drugs under the supervision of a nurse. Think of them as chemical halfway houses for people at risk. Overcoming addiction is an epic struggle that the average person fails to understand. Progress is gradual, and weaning addicts from drugs is dangerous. The recovery is usually worse than the addiction. Because British Columbia is so large and spread across rural areas, many addicted people don’t have access to these clinics. The solution of highly secured ATM-like machines that dispense hydromorphone pills up to three times a day could save thousands of Canadian people and dollars. The pills are a relatively safe form of opiate that can bridge the difficult moments an addict faces on the road to recovery. The average cost per day would be $3, compared to $70 at the clinic. The danger of overdose would diminish exponentially, especially in a country that also provides citizens equal access to psychological therapies to combat addiction. Consider my friends two sons. A 43 year old man in the US who suffers from depression is far less likely to get the care that he needs than in any other developed, democratic nation. “Adults in the U.S. living with serious mental illness die on average 25 years earlier than others, largely due to treatable medical conditions.” My friend’s son had a treatable condition. His suicide could have been prevented if he had easier access to healthcare. 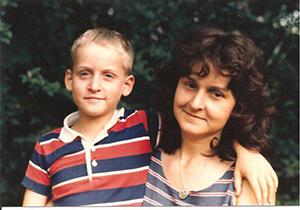 My friend’s younger son was struggling with addiction for a number of years. No matter where he stood in his road to recovery, facing the trauma of his brother’s suicide put him at an exponentially increased risk for relapse and overdose. 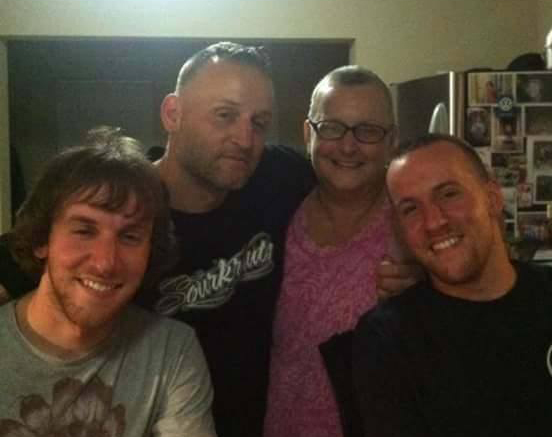 When his mother and twin brother cleaned his room, they found pamphlets for drug rehabilitation programs. If he could have had access to programs like the ones in British Columbia, he might be here today. Any mother can see that. Fern and All three of her boys- Clark, Liberty and Brae. Hello dear Nancy…just catching up on your work and deeply moved and inspired by its intensity, skill and care…grateful for your gift to our world….